I last wrote about Diageo's Single Malt Scotch Flavor Map in early 2009, so it's time for an update. I discovered Single Malt Scotch a few years ago and became an immediate fan. I liked the peaty stuff right off, so the salesman at my local store suggested a 12-year-old bottle of Highland Park from Scotland’s Orkney Islands. It was a good choice: smooth, mellow, and with enough peatiness to please but not overwhelm my newbie taste buds. Next time around I took his advice again. He suggested a well-known label, but I was disappointed by its tame taste. It was clear that I needed a better method to find what I wanted. 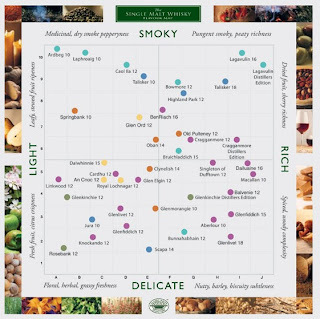 The Flavor Map plots whisky brands on a vertical/horizontal axis. Horizontally, they range from Light to Rich. Vertically, from Smoky to Delicate. Thus, once you determine a whisky you like, you’ll probably also enjoy other nearby whiskies. For instance, the brand I liked first time out (Highland Park 12) is in the Smoky/Rich quadrant; its closest neighbors are Bowmore 12 and Talisker 18, which gives me two likely possibilities to try. A bit further away, but still in the same quadrant, are Cragganmore 12, Bruichladdich 15, and Lagavulin Distillers Edition. If you're a single malt fan, this handy Flavor Map is an absolute must. And it's free to download! Download a free copy of the Single Malt Whisky Flavour Map. 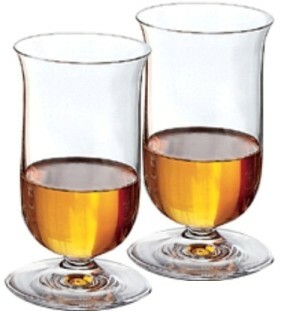 Single Malt and other fine whisky fans know that the shape of a glass can maximize enjoyment of its contents. Part of this has to do with aesthetics: that is, the simple pleasure of holding and admiring a beautifully-designed glass. But equally important is that a glass with the right size and shape can enhance aromatics and thus taste. Back in 1992, in a quest to develop the ultimate whisky glass, famed Austrian glassmaker Riedel brought together a panel of Scotch whisky experts to test nineteen different glass shapes. Afterward, with the help of master distillers in Scotland, the company continued making refinements. The result? The perfect glass for any fine whisky. Shaped like an elongated thistle on a truncated stem, the Riedel whisky glass possesses a slightly outturned lip. This long glass, warmed by the hand, permits the release of aromatics perceived by the nose in a slowly-unfolding, multi-layered sequence of discovery. And that’s even before the shaped lip directs the whisky to the tip of the tongue, from where it expands into the mouth for that first velvet feel. Riedel makes two versions of its whisky glass: (1) the mouth-blown/hand-crafted (and expensive) Riedel Sommelier Whiskey Glass, and (2) the machine-made, reasonably-priced Riedel Vinum Single Malt Whiskey Glasses. I’m a Vinum fan because these glasses offer beauty, utility, and value: a set of two costs $39.95. The glasses are beautiful and thin (but not so thin that they break if you look at them the wrong way). They possess no “machine” seams, and the Riedel name is etched on the base. They stand 4.5” high and hold 7 ounces. Although they’re dishwasher-safe, hand-washing is recommended. Addendum: Want to learn more about single malt scotch? It doesn't get better than British writer Michael Jackson's classic Complete Guide to Single Malt Scotch.